Unfortunately for owners of itchy cats, the bad news is that cat fleas can bite humans. Fortunately, you can take steps to treat the fleas and eliminating them from your home, letting both you and your kitty get a little itch-free peace. Chances are, most people asking about cat fleas on humans have noticed a few small bright red spots running up and down their arms or legs. Cat fleas can definitely bite humans and this can easily happen when a cat suffering from a flea infestation comes into your home. You can easily get fleas on you by interacting with your cat or places where it's been. Fleas will jump off of a cat's body onto your furniture, carpets, bedding, and your pet's bed as well. They can also jump onto you while your cat is cuddling on your lap and you are stroking them. 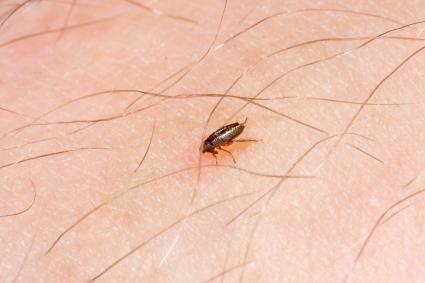 Since fleas are so tiny, it's easy to miss them as they move about your home and jump onto you and your furniture. Fleas live by drinking the blood of their host, whether it's a cat, dog or humans. When a flea lands on you and comes into contact with your skin, it's a natural response for them to bite down and feed. Generally, fleas prefer the "environment" found on the skin and fur of a cat or dog but they'll happily take advantage of you if they have a chance. Many pets that have outdoor access will acquire fleas from time to time. Dogs can get fleas as well as cats, but interestingly enough, the flea most commonly found on dogs is actually the cat flea. Dog fleas are only responsible for about five percent of flea cases, so this makes the cat flea the largest enemy of both cat and dog owners. Cat fleas get onto dogs in your home in the same way they can get onto humans. If the fleas on the cat are jumping off onto the carpet and furniture, they're sure to get onto your dogs as well. Although it's very rare, flea bites can lead to more serious conditions for people including tapeworms, typhus and bubonic plague. There are various approaches to battling a flea problem, but pet owners should be aware that the real flea problem is not located on your cat. Only a small percentage of the fleas that attack your arms and legs are present on your cat. Instead, your carpet, rugs, furniture, and even bedding in addition to outdoor lawns are the real culprits housing these fleas. As if the very idea of such a flea population isn't disturbing enough, fleas defecate as well. Flea excrement looks like tiny black dots or grains of sand, and you will find this "dirt" everywhere if you don't meet your flea infestation head on. You'll first want to treat your cat with a flea treatment whilst simultaneously treating your home and garden. This can be a bit complicated because you don't just have to worry about live fleas, you will also need to keep watch over the eggs fleas lay on your pet. These eggs are hiding in your carpets and bedding. An easy quick fix is to call an exterminator who can spray your indoor and outdoor area, but one treatment will not be enough. It takes weeks for eggs to hatch, so you'll want to schedule several follow-up appointments and keep your cat on regular preventative medication. If your symptoms are mild and you are not allergic, you can treat your flea bites with some simple first aid. Wash the affected areas gently with warm water and mild soap. If the bites are swollen, you can use an ice pack on the affected areas. Use over-the-counter ointments with antihistamine and hydrocortisone. If you notice any symptoms indicating an allergy, seek out a medical professional right away. Within your home, you'll want to vacuum thoroughly and clean your drapes and bedding. Any soft warm place that seems accommodating to fleas should be suspect and, therefore, cleaned. If you are truly a do-it-yourself sort of person, CatsofAustralia.com has published an excellent article on proper flea extermination for pet owners. This process needs to be executed with utmost care because, when done sloppily, you'll end up back to square one. You will need a heavy duty vacuum cleaner to tackle the dander and flea residue that results from an infestation. If you can afford it, the Dyson Animal Vacuum is one of the best for inhaling everything from pet hair to persistent particulates. Vacuuming frequently with a quality machine during and in between chemical exterminations is your second line of defense. If this is not your first battle with cat fleas, you may also want to consider confining kitty to the indoors. Many cat breeders will not sell kittens to homes that promote free-roaming pets, so you won't be alone in your efforts. Flea collars can help somewhat in keeping fleas off your cat but they are not 100% effective. While many cat owners prefer to go the DIY route when removing fleas to save money, a flea infestation can be very difficult to remove from your house on your own. Hiring a professional exterminator may be costly but it could save you money in the long run with reduced visits to the veterinarian for your cat as well as reduced medical costs for you. This is especially true if you suffer from a flea allergy and have a greater risk from bites. An exterminator can review your property to find areas that you may have missed, and use products that will affect all aspects of the flea life cycle. If you're concerned about the chemical exposure, discuss with your veterinarian who can provide referrals for flea control companies in your area that are safe for your home, your family and your cats. There are many wonderful benefits of owning a pet but dealing with fleas can definitely be a pain for your cat and for you and other pets. If you have a cat that goes outside, your risk for bringing fleas into the home increases. 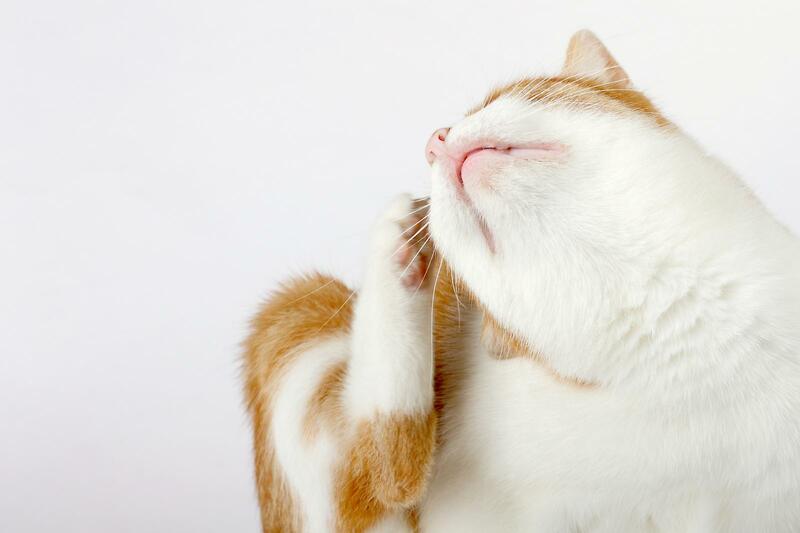 Make sure you know the signs and symptoms of flea bites on yourself and on your cat and do not delay in taking action if you suspect fleas are in your house and on your pet.